Toric Lens Technology mimics the curvature of the human eye for superior optics while also providing enhanced peripheral vision and maximizing the possible vent volume in the goggle. New Sonar Lenses by Zeiss® enhance contrast for the best possible definition and terrain recognition. The Circuit goggle is Over The Glass (OTG) compatible for wearing with eyeglasses. Toric Lens Technology mimics the curvature of the human eye for superior optics while also providing enhanced peripheral vision and maximizing the possible vent volume in the goggle. New Sonar Lenses by Zeiss® enhance contrast for the best possible definition and terrain recognition. The Circuit goggle is Over The Glass (OTG) compatible for wearing with eyeglasses. Includes microfiber goggle bag for storage. Anon&apos;s variable density face foams utilize moisture wicking fleece that provides a perfect goggle-to-face fit, sealing out the elements while providing hours of riding comfort. Anon goggles are constructed with the highest quality thermoplastic polyurethane (TPU). Thoroughly tested on hill and in the lab, Anon&apos;s TPU has the highest resistance to abrasion, maintains consistent flexibility in changing temperatures and has superior elasticity to fit every face shape. Toric Lens Technology combines de-centered technology with lens curvature that mimics the curvature of the human eye for superior optics while also providing enhanced peripheral vision and maximizing the possible vent volume in the goggle. Exclusively developed for snow sports by Anon and Zeiss®, the New Sonar lens increases depth perception and enhances contrast for the best possible definition while retaining true world colors. 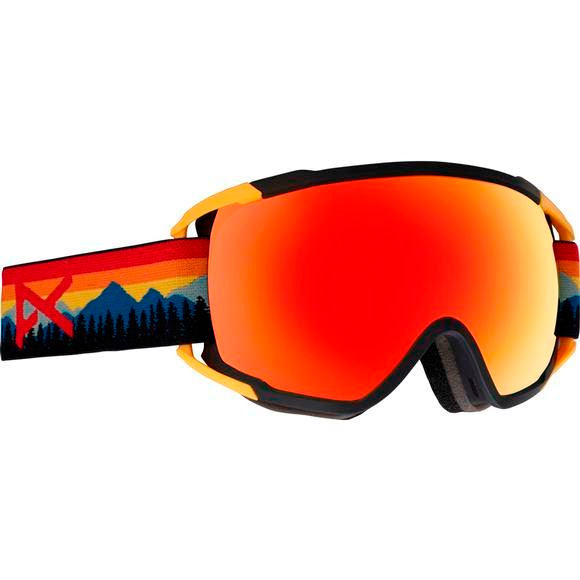 Anon offers a wide range of frames that can accommodate prescription eyewear worn underneath the goggle, which means never having to sacrifice vision, comfort or style on the hill. Anon Full Perimeter Channel Venting ensures maximum airflow, bringing fresh air into the goggle while pulling moisture away fromthe lens. Full Perimeter Channel Venting works in tandem with ICT to provide clear, fog-free vision in all conditions.